The RAINN Concert Has Been Released On Home Video In the U.K., Europe, and Australia In PAL Format & In Canada In NTSC Format. While the video was not officially released in the U.S., it is out in Canada in the NTSC format. Toriphiles in the U.S can simply order the Canadian import of Tori Amos Live From NY at several online music vendors, including CDNow , CD Universe and Music Boulevard . Many Toriphiles tell me that you can find this video now in several stores in the U.S, but reports clearly indicate that it is a Canadian import. The RAINN concert video called Tori Amos Live From NY is available now at stores in Canada in the NTSC format! BJ, Nancy, and Miriam all say that Sam The Record Man is carrying this video. One person paid $24.99 for it. I have reports from Shane and others that HMV is carrying it as well. Look under conversion tips below to find a place called 3D RESEARCH that will convert the video from PAL to NTSC for you at a very reasonable price! You will only need to convert the video to NTSC if you live in North Amercia and bought the video in the U.K. or Australia. Tori singing "Precious Things" from the video "Tori Amos Live From NY". She is doing the girlllll part in the left photo. Read a review of the video from the November 1997 issue of the British Magazine Vox. Read another review of the video from November 1997 issue of the British Q Magazine. Toriphile Jas gives the following set list for this video, which happens to be the same as the one reported for the actual concert. This set list was confirmed by Ears With Feet Richard (aka Mr Microphone), who added that all the songs from the original concert are on there, but some of Tori's banter with the crowd has been edited out. 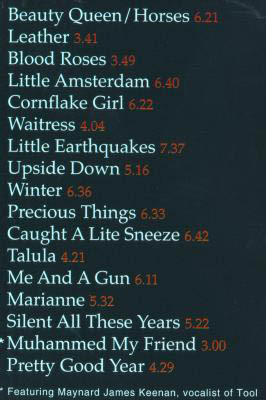 The times for each song were provided by the Planet Tori web site . Dennis Snelders has added to his web site, Little Amsterdam, an in-depth look and review of the RAINN video. Little Amsterdam gives Tori news tailored for fans in Holland and Europe. The video is called Tori Amos Live From NY and is from Warner Music Vision. The video debuted on November 17, 1997 in the U.K. and early February 1998 in Canada. There may be an official release in the U.S. later. The video tape costs 149 french francs, and it's reference is : 756780 7323. it's a PAL tape (be careful, we are in SECAM format in France). I wanted to point out that VHS is a tape-format whereas PAL is a video format. 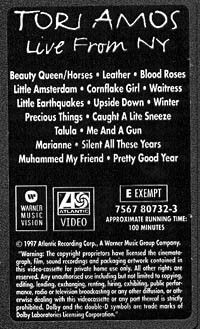 The US equivalent (all NAmerican video) is called "NTSC". This is important, because in Europe you do have VHS tapes, so you can buy a VHS tape here that will not work in the US! (In fact, tapes here are PAL VHS). So the real question (for people in North America) is whether it will be released in NTSC. The video format says how the signal is encoded on the tape, and how your TV interprets it. The tape format says whether it will mechanically fit into your machine (sortof). Tape formats e.g., VHS, "BETA", HI-8 are independent of video format. You can buy TV/videos that work with both systems, though. There is also a format used in some places like France known as SECAM. I've actually had a bit of experience in converting PAL to NTSC. The best and, in most cases, the only way to do it is to go to an electronics store or a TV/VCR repair shop and have them convert it for you. Depending on where you go that could set you back anywhere from $30 to $150. You might want to look through your local yellow pages and check out some VCR repair places ads; some places pride themselves on tape conversion. Unfortunately, you can't do the conversion yourself, unless you have a VCR that has the ability to play and record both systems. These VCR's are pretty expensive and are hard to find in the US. Since it's a part of their business, those VCR repair shops invest in conversion systems and duel system VCR's. That's why your best bet is to go there. Words of caution: Don't just go along with the first person who is willing to convert it, you could be seriously ripped off. In this kind of situation, quality really matters. So really scope out other places and what they're willing to offer. Ask them to show you a coverted copy of a tape. I understand some Toriphiles are in an area where their options are limited, but do your best. I wouldn't want anyone to lose money to gain something crappy. I know, I know I sound like I'm writing for Consumer Reports, but I've gone through this a hundred times and got ripped off so many times, I don't want people to go through the same thing.